Of course there are many other pages on a typical e-commerce website, but the main core user journey would entail touching the above pages and that’s where testing e-commerce websites should focus on: The Checkout Journey. A typical user journey flow would start at homepage, or a product landing page, searching for a product, reviewing the product, adding product(s) to the shopping cart, fill in order details and payment details and submitting the order. Shopping carts are one of the main features of an e-commerce website and thus form the center piece of testing e-commerce websites. It allows for customers to select and store multiple items in the cart and purchase them all at once. Add one item to the cart – the cart should be updated with the item with correct name, image and price. Increase the quantity of item from the cart – the price should be updated to reflect he correct figure. Add multiple items of different types – For each item added, we should see a corresponding name, image and price and total price of all items. Click on an item in the cart – we should be able to see more information about the product we just clicked either as a popup or redirecting to product page. Add item(s) to the cart, close the browser and reopen the same site – ideally the cart should still hold your items. N.B this particularly depends on the requirements on how the cart should behave. The search form is usually present on multiple pages to allow users to search for products wherever they are on the site. Therefore, it is important that the search feature is tested from applicable pages. Most probably the code for the search module is reused in multiple pages or templates, or it could be part of the header section which is displayed across the whole site. If this is case, the behavior of the search feature should be the same wherever it occurs and running all test cases on all pages is a waste of exercise. Number of products per page – check that the number of products per page matches the requirement. Filtering and Pagination – Again, this is important, when we filter in one page, ideally as we paginate we would want the filter to be applied throughout. Sorting and Filtering – an important test case is mixing the sorting and filtering options together, e.g. filter by price and then sort by price high-to-low, or other way round. Whilst the individual features on their own might work correctly, when combined with another feature, the functionality of one or both features might break, so it is essential that we check the results when combining filtering with sorting. Sorting, Filtering and Pagination – this is checking that when both sort and filter have been applied, they remain as we paginate or more products are loaded. Some e-commerce websites allows you to purchase an item as a guest, i.e. without the need to create an account, and then an optional step to create an account when an order is placed. When an account is created, the user can login at any stage during a purchasing journey. It is important that we test all these variations along the user journey when testing e-commerce websites. Create account and login before purchase – this is to test that the item you purchase gets added and connected to the correct account. Also you should not be prompted to login again once you have already been logged in. Login session – when you login check that you stay logged in as you browse products. Also you need to test the behavior when the user doesn’t interact with the site for some time. Will the session expire after a period of time? Make sure the user has actually been logged out after the session times out. Login and Logout – when you are logged in, logout and make sure you are logged out and that you cannot access any of the accounts pages. Payments are an essential part of testing e-commerce websites. After all this is what allows users to purchase for their items without the need to call a number to place their order. Cancel the order or change the quantity of the order. Review your recent order and history of purchased items. Changes to the account, such as billing address, shipping address, change password, change profile information such as name, email address and even deleting an account. 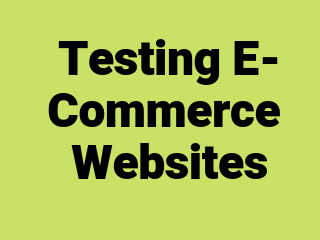 What’s most important when testing e-commerce websites is to make sure that each feature has correctly implemented its requirements.